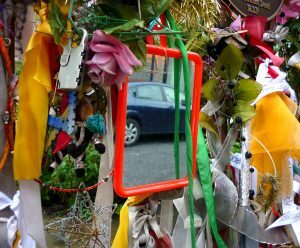 Our monthly Vigil for the Outcast, dead and alive, has been held at 7pm on the 23rd of every month since June 2004, at the red gates in Redcross Way, London SE1. In the process, we may feel intense sadness, grief or anger for our own losses and for the injustices of the world we’ve made. As we work through these feelings, we can also experience great joy and healing, a sense of mending things that are broken and sharing in an act of transformation. At the heart of the Vigil is a space for us to offer a song, a poem or a personal testimony to The Goose and the spirits of her Outcast Dead. John Crow, who often conducts the Vigil, performs work from The Southwark Mysteries, as revealed by The Goose at Crossbones, Jules shares wise insights into the universal revealed in the particular, Jennifer and other regulars speak as the spirit moves them. Together we build a community around a beautiful act of street magic. The Vigil ends with a collective unconditional blessing. * We’re not a religion; just a bunch of outcasts at work and play to heal ourselves. Join us. Free! Donations welcome.